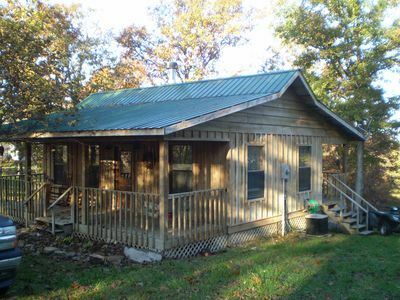 Pet-Friendly Cabin w/Deck - Steps to White River! 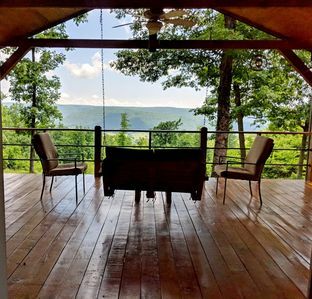 Have the ultimate serene getaway when you stay at 'Around the Bend,' a 3-bedroom, 1-bathroom vacation rental cabin that sleeps 8, just a few feet from the White River. 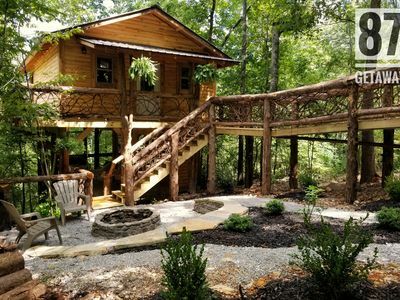 Surrounded by nature and wildlife, this charming and spacious cabin is perfect for groups of friends, families, and couples seeking an adventurous outdoor holiday in the comfort of an inviting home-away-from-home. Explore the quaint downtown area of Mountain View just 7 miles away! 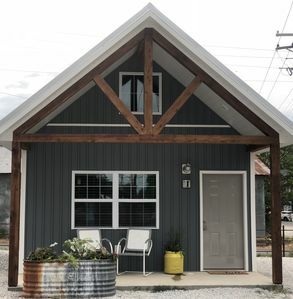 As you enter ‘Around the Bend’, you’ll discover a charming 1,600 square feet of well-lit living space with mountain-themed decor gracing the walls, providing a sense of warmth and welcome. 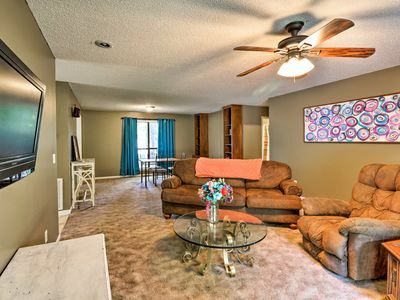 Through the front door, you’ll find the adorably decorated living room area, complete with cozy sectional sofas, recliner chairs, and a flat-screen TV. 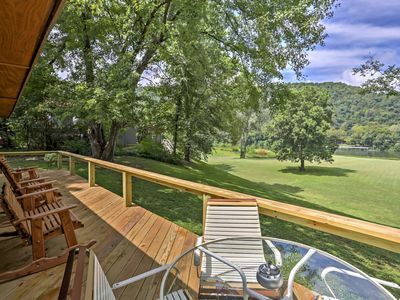 Through the living room is a sunroom and lounging area where you're sure to spend hours relaxing in the rocking chairs or couch that look out at the river and forests beyond. Through the sun room's sliding glass doors is an outside patio area with unobstructed river views! Relax out here long enough and you're sure to catch a glimpse of the local wildlife! The 6-person dining room table is nestled between the sunroom and living room and acts as a divider from the kitchen. The chef of the group will relish in the charming, fully-equipped kitchen, where whipping up your favorite recipes is a pleasure rather than a chore. 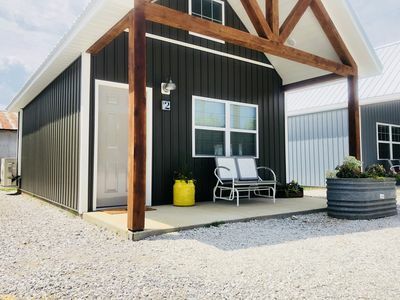 The ranch-style cabin offers both a master bedroom and guest bedroom on the main floor, featuring beautiful tile and soft carpeting throughout. 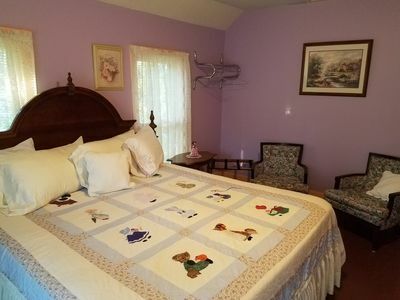 Two bedrooms in the house are furnished with comfortable King and Queen-sized mattresses that offer uninterrupted nights of sleep and welcoming mornings. 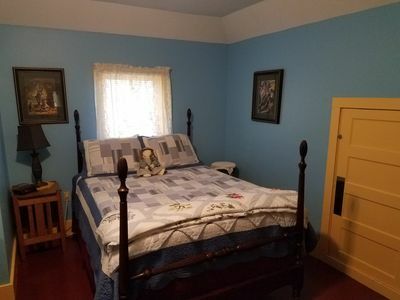 And the third bedroom has a a great twin-over-twin bunk bed where guest can sleep uninterrupted and catch up on rest. 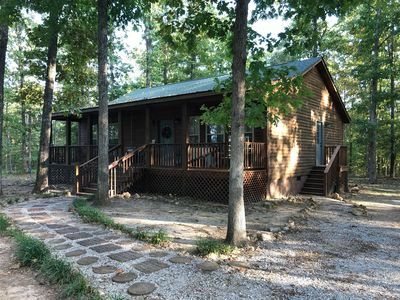 If you are traveling with a larger group or the whole family, book 'River Bend Cabin', a 3-bedroom, 1-bathroom cabin that sleeps 8 guests and is located one minute away just down the road. 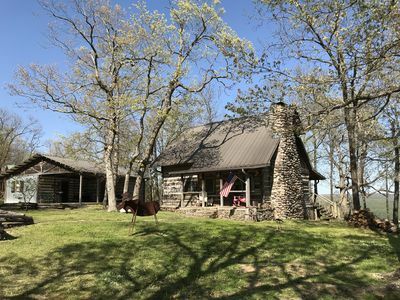 While staying at this superb cabin, you’ll be surrounded by a wide variety of outdoor activities and only a short distance from the historic downtown area for entertainment, dining, shopping and more! 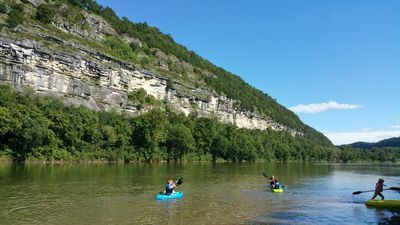 Spend your days outside hiking, mountain biking, fishing, and canoeing around the river. 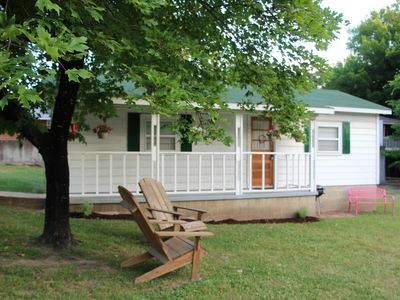 Enjoy fishing only 25 yards from the house on the private land with river access. Explore the river more as you walk up and down the shoreline or rent a canoe and float the flats! Test your strength and agility when you visit Loco Ropes, a jungle gym high in the Mountain View Trees that offers 30+ obstacles to overcome. At Loco Ropes, the whole family has fun! 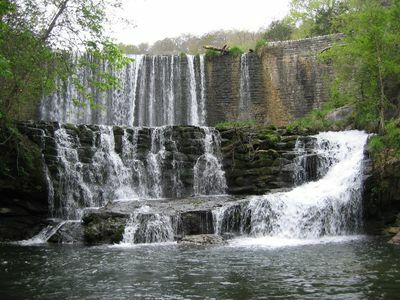 For more adventures, visit some of the caverns and waterfalls in the area via amazing hiking trails, which wind through streams and over rivers to scenic viewpoints. For a more relaxing day, visit the historic downtown Mountain View and browse through the many antique shops and clothing boutiques for an unforgettable gift or memorable souvenir! Afterward, stop by one of the many restaurants in the area and treat yourself to a multi-course meal or casual dining experience! 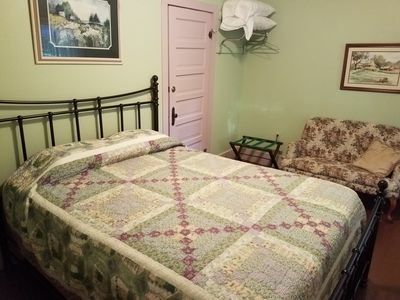 - Amenities include a fully-equipped kitchen, flat-screen cable TV, air conditioning, charcoal grill, coffee maker, and much more! 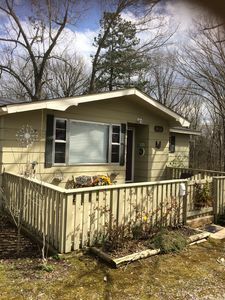 - Peaceful Property - Situated a few steps from the White River on private land and private river access. Surrounded by forests and boasting spectacular mountain views! 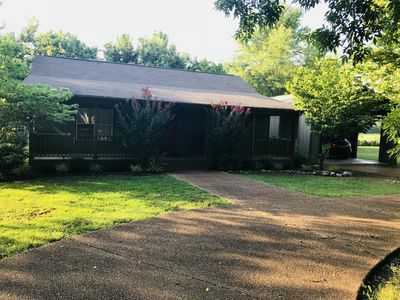 - Fantastic Location - located only a few miles from downtown, but still away from the hustle and bustle. Remote yet easily accessible. 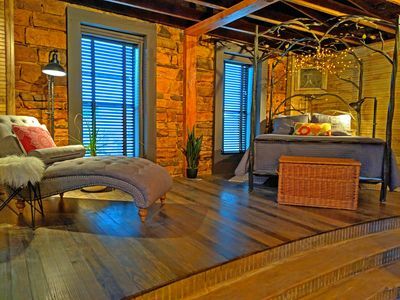 Relax and enjoy the peace and quiet at the Triple H House. 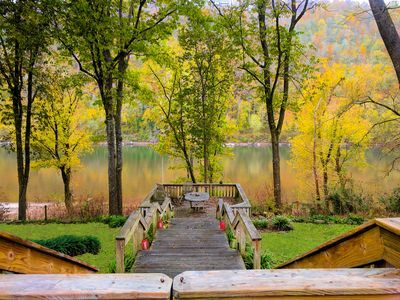 Beautiful cabin style home backing up on the White River! Music or River? 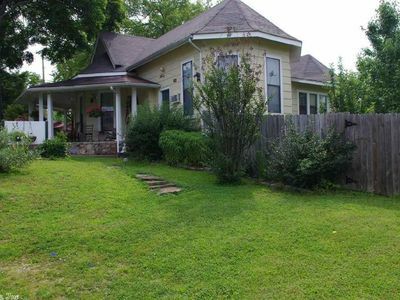 This property is located between the town square and river.